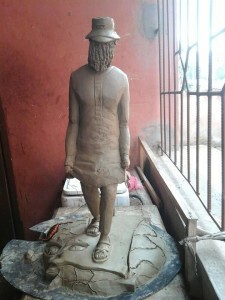 Celebrated investigative Journalist Anas Aremeyaw Anas, has been honoured with a sculpture molded in his honour by a final year student of the University of Kwame Nkrumah University of Science and Technology (KNUST), Godwin Addo. Anas received the artwork from Godwin at the premises of Kumasi-based Ultimate FM on Friday November 20, where he had gone to be interviewed. Anas Aremeyaw Anas, whose work for years has focused on naming, shaming and jailing wrongdoers of society, has received massive commendation following his recent two-year investigative piece on perceived widespread corruption in Ghana’s judiciary. Some 34 judges and magistrates, and over hundred judicial service staff are currently under investigation for allegedly taking bribes to influence justice. 24-year old Godwin Addo, whose artwork became public after the preparatory stage of it was shared on social media and publicized on local and international news portals like the BBC, says the piece, which forms part of his academic research work, highlights the deep issues of corruption in society and honors the celebrated journalist. 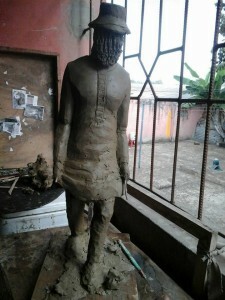 Prior to Friday’s presentation to Anas, Godwin told 233 in an interview that he aspires to be a great contemporary sculptor whose work will carry stronger messages to the masses. Asked what his view on corruption is, Godwin Addo said the best way to fight corruption is to start from the individual, move to a group, an origination, a country and then the world. He says he will design other artworks to represent the various stages of the fight against corruption from his perspective. Godwin however said he was to yet see Anas’ latest video on judicial corruption although he has heard about the details. “It was sad especially because the world has seen what is going on in our country and knowing that the judiciary is corrupt from the head is worrying. It also tells me that it is not easy to fight corruption. How much did it the artwork cost you? “Actually it’s a multiple cast so I used silicon and the main work in clay and used silicon as the mode picking material which cost about Ghc1, 000. The fiber glass also cost me about Ghc1, 000 so in all is about Ghc2, 000. How do you feel about this artwork?